One of the most useful tools for micro-controller design is the logic analyzer. You can find one for every budget or performance, but lately those based in USB connection to PC have gained popularity (not not mention the chinese copies). 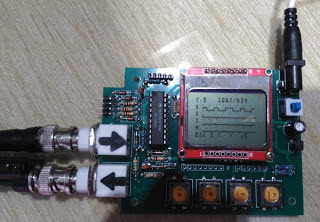 The main drawback of USB based logic analyzer is the need of using a computer, which uses to be a bit difficult when doing field testing. Digitool isn’t intended to replace a logic analyzer; it’s main purpose is being a quick test tool for microcontroller based development. Frequency measurement up to 10Mhz, with 2 gate times (1 sec and 0.1 seconds), TTL input. Square wave injector, 10 frequency steps, up to 1Mhz. The injector is based in microcontroller’s PWM module, so it can be working no matter of which function is being used in the Digitool. Logic probe with 4 channels, 1024 samples buffer depth and 500 ksps rate. Acquisition can be triggered either by pushing a button or by edge change in any input. Sample rate will be improved in next firmware releases. User interface with 4 buttons and option menu shown in screen’s bottom line. Language used: Jalv2 + Jallib libraries. EDA software. Kicad v 4.0.5. Development done under Mac Os Sierra for EDA and programming. PIC programming done under Windows using Pickit2. Microntroller: PIC18F2525 @ 32 Mhz (cristal de 8 Mhz crystal and inner PLL), powered at 5 Volts. RAM data access in logic analyzer mode is done using PIC’s POSTINC registers, which increase writing speed. Gate time for frequency meter is done using timer 2 as a source to trigger the interrupt routine. A zip file containing all source code, schematics and board design is available for download here. Source code will be available (in following posts) for downloading for eveybody. Any derivative based on Digitool is requested to mention original design. Digitool has been designed for author’s use and hoping that it can be useful for any DIYer. The tool is not intended for professional or continuous use. The author declines any liability for damages (either personal or material) or injuries due to the use of this tool; use it under your own responsibility.